Oh my God. Oh. My. God. OH MY GOD! 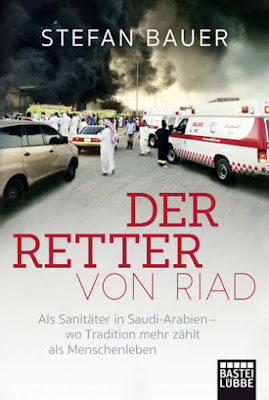 Sometimes, I find myself mumbling to myself these words, as I read Stefan Bauer's experiences as a paramedic in Saudi Arabia. It is a very fascinating read, and I must say, sometimes things can get shocking. See, as a paramedic, you see many things that are sometimes unthinkable. And it gets more complicated when you're in a land where traditions sometimes overrule humans. In Saudi Arabia, sometimes it is more valuable to protect one family's honour for example, than to save one's life. Or sometimes, it is more important to obey the tradition that husbands are the only ones to touch their wives, than to save an unborn child from dying due to suffocation due to a wrapped umbilical cord. For Stefan Bauer, a paramedic educated in Europe, sometimes these traditions clashed with his desire to save the lives of humans. And sure enough, he has seen plenty of dead people, and many of them could have been saved if they somehow just let go of their traditions. See, this was a tough read. It was tough for me to read how plenty of people sometimes believe in very absurd things due to religion. They would rather let their wives die than have a male stranger paramedic touch them. No wonder this book just reinforces in me the thought that religion is a negative force in society, and must be eliminated as much as possible. I am not picking on Islam. Heck, other religions also have practices and beliefs that contradict current medical knowledge. Take Jehovah's Witnesses for example, and their stand on blood transfusions. They would rather have their family members die in hospitals, than to have blood transfused to them, even if this is needed to save their lives. When I was still a member, I had been carrying a card with me, a legal document that was signed, saying that I do not want blood, in case an emergency happens. This "Blood Card" was one of the first things I ripped apart when I decided to leave this cult. In any case, reading this book made me appreciate where I am living, a modern progressive society, where human lives are valued more than antiquated traditions. I can only imagine how traumatic it was to live and work as a paramedic for a year in Saudi Arabia. I cannot imagine myself being in a situation where there was a man, beheaded by his own family, just to preserve the family honour, and in front of police, this family would want the death to be classified as suicide. There are many disturbing things in this book, and I must say this book is not for everyone. But if you do decide to read it, it would open your eyes, and if you're living in a modern society, you'd probably appreciate where you are. I give this book 4 out of 5 stars.